From Left: Former President Maumoon Abdul Gayoom, Supreme Court Judge, Ali Hameed Mohamed and the Chief Justice, Abdulla Saeed. 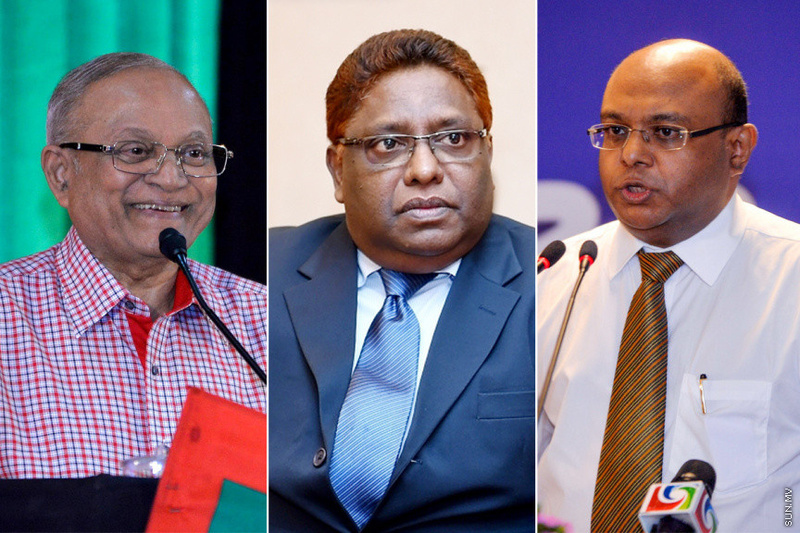 The hearings set for tonight in the trials against the former President Maumoon Abdul Gayoom, Chief Justice Abdulla Saeed and the Supreme Court Judge, Ali Hameed Mohamed, for refusing to turn in their phones, has been cancelled. All three are charged with obstruction of justice in relation and a hearings were set for 9:30 p.m. tonight before the Criminal Court cancelled the hearings.The court did not reveal as to why that was. The current proceedings in the trial is the testimonies from the state witnesses. At the hearing last night, three people gave closed testimonies. As the hearings are proceeding without defense lawyers, all three defenders have slowed down the proceedings and asked for the opportunity to appoint a lawyer. In response, the Judge presiding Hassan Najeeb said that all three have the chance to appoint a lawyer but the hearings cannot be postponed.